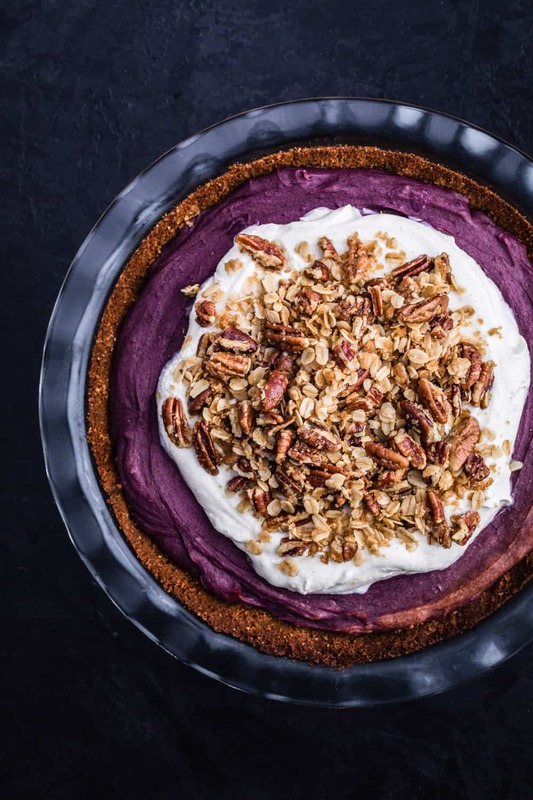 Please meet my very purplelicious version of the classic sweet potato pie filled with seasonal flavor, paired with a gingersnap crust and served with a dollop of maple whipped cream and pecan streusel. The perfect comfort food for the health conscious cook and the ultimate showstopper on any Holiday table! Slow-roasting the sweet potatoes brings out their natural sweetness. 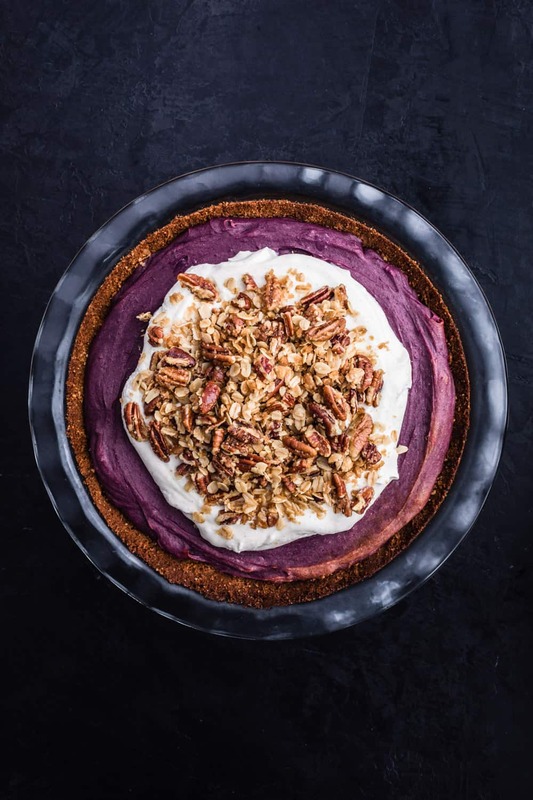 The gingersnap crust adds a bit of unexpected spice and more flavor than a traditional crust. The savory 5-spice and walnut notes balance the sweet streusel topping. The pie falls in that magic intersection of easy to make and looks highly impressive! Lusciously creamy, vibrantly purple, and lightly spiced filling that tastes as enticing as it looks ~ yum! Pour filling into crust and bake. 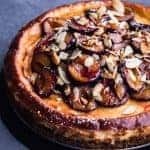 Roast the sweet potatoes, make pie crust in food processor, bake pie crust, when sweet potatoes are done peel them and pulse flesh in food processor, whisk in remaining filling ingredients, pour filling into prepared pie crust, bake all, make pecan streusel, make whip cream, top pie with streusel, and briefly pop back into the oven. Serve with freshly whipped cream and enjoy! Pour filling into curst and bake. Did ya know that not all sweet potatoes are purple inside?!?! 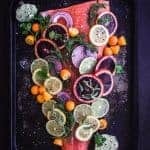 Flesh can range from being light beige to purple, making for some *very* purplelicious dishes! But this pie works with any color on the sweet potato flesh rainbow ~ YAYA! There’s a bit of controversy surrounding if all yams are sweet potatoes (though sweet potatoes are def not yams) and after a bit of researching this is what I got for ya. Hate to be the bearer of bad news but most of the so-called yams ya see in US grocery stores are actually sweet potatoes. The story goes that back in the 30’s Louisiana sweet potato growers marketed their orange-fleshed potatoes as “yams” to distinguish from the other states produce and its stuck ever since and created all sorts of yam-sweet potato confusion. Real yams are entirely different root vegetables that are more like yucca in texture and flavor, starchier and drier than sweet potatoes. Conclusion: sweet potatoes and yams are different. We’re talking sweet potatoes, here but you’re welcome to try this recipe out with yams and let me know how it goes in the comments below. Glad we got that sorted out! I like my sweet potatoes in all sorts of colors and sweet and savory ways. Mashed, roasted, and made into classic pies like this recipe here. 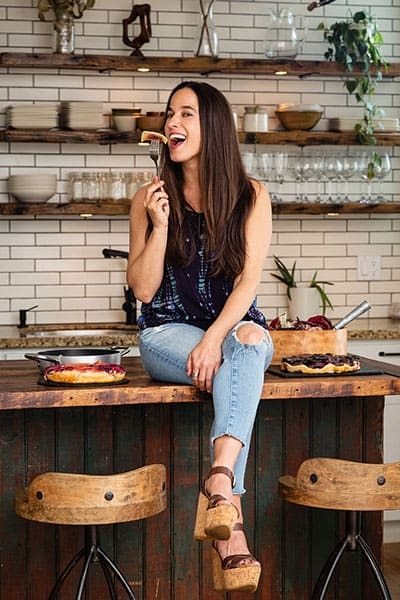 For some sweet potato savory style, please check out my root veggie tarte tatin. Don’t forget to pierce sweet potatoes with a fork several times so that steam can escape while they’re baking. 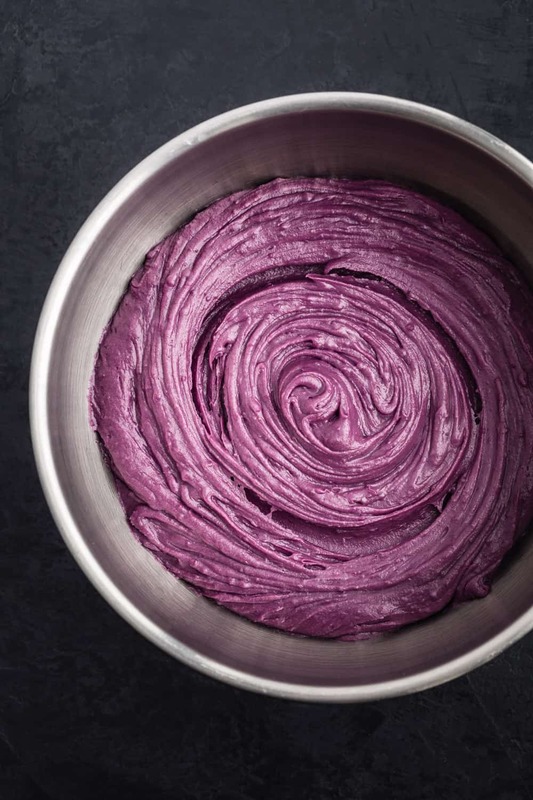 To make the purple hue filling an even deeper purple, add ube extract. 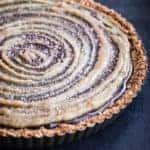 To make this pie vegan, use coconut oil in the crust and streusel, coconut milk for the filling, and omit the whipped cream. The crust can be baked 1 day ahead and stored tightly wrapped at room temperature. Don’t top the piping hot pie with whipped cream or you’ll have a bit fat melt-y mess… which I know from experience! Ya DEF wanna add this pie beauty to your Holiday repertoire where it will be unlike any other delicacy on your table! Let’s makes waves in the kitchen! Preheat oven to 350 F. Pierce sweet potatoes several times with a fork all over and wrap each with aluminum foil. Bake in preheated oven until tender, 1 hr. – 1 ½ Remove from oven and let cool. 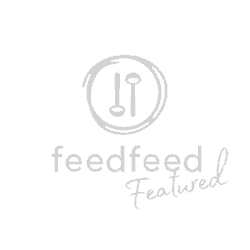 While sweet potatoes bake, place the gingersnap cookies in the bowl of a food processor and process until they are finely ground. You should have about 2 cups. Add the walnuts and sugar; pulse to combine. Add the butter and pulse briefly again until everything is mixed together. 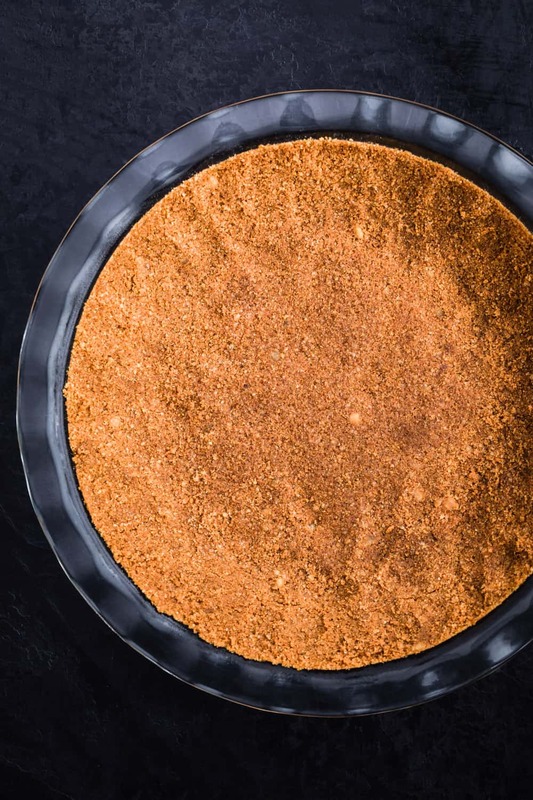 Pat the crust into a deep 9-inch pie plate, and up the sides. Bake for 10-15 minutes (at 350 F), until firm and slightly darkened. Set aside to cool. Note: Crust can be baked 1 day ahead. Store tightly wrapped at room temperature. Peel cooled sweet potatoes and discard skins. Process yams in a food processor until mixture is smooth and forms a ball, about 1 minute. Place yam mixture into a large bowl and whisk in brown sugar, evaporated milk, 1/2 cup butter, eggs, vanilla, ube flavoring, 1/2 teaspoon cinnamon, five-spice, salt, and nutmeg until smooth and combined. Pour sweet potato mixture into prepared gingersnap pie shell. Bake in preheated oven until filling is set, about 50 minutes. Remove pie from oven; sprinkle center of pie with oat mixture. Return to oven; bake at 350°F until topping is lightly browned, about 10 minutes. Transfer pie to a wire rack to cool completely, about 4 hours. To make maple whipped cream: there’s two options: by hand (use that elbow grease!) or in the food processor. LOVE the colour of this pie. Perfect for Easter dessert. I wish I could find these purple potatoes. I have only seen them a few times in the store. This is stunning. Thanks so much Gloria!!! Hoping ya find purple sweet potatoes too! Would love for ya to make this for Easter :). Perhaps you’ll have more luck at the farmers market? Wishing purple sweet potatoes come into your life super soon and thanks again :). Thank ya so much Tammy!!! Super stoked on your sweet feedback :). Really appreciate it! And please let me know how it goes after you make it… I’d absolutely love to hear! That colour is so amazing and vibrant – such a pretty dish! This may well be appearing on my Easter table this year! Yaya!!! So super stoked to hear that Carrie! I’m def a very vibrantly colorful food kinda gal :). And please let me know how it goes after you make it… I’d absolutely love to hear! 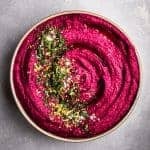 What an amazing and fun recipe! 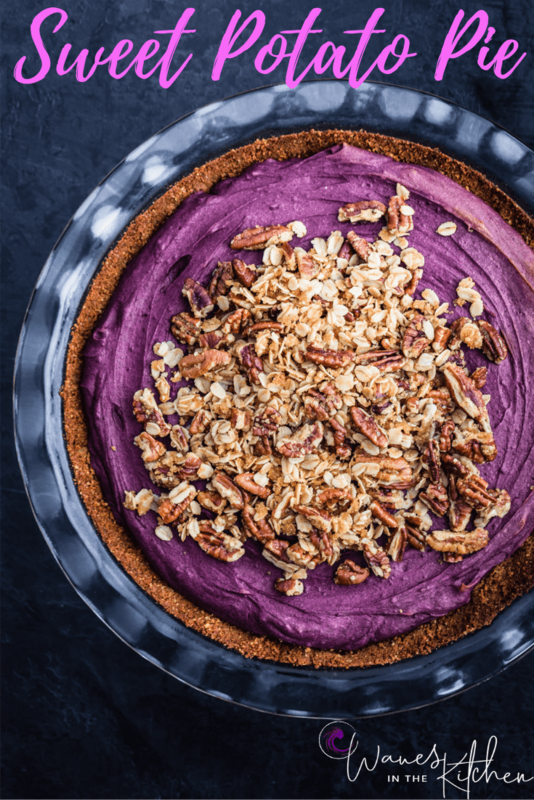 I need to find some purple sweet potatoes to make this! Ya you do Denise!!! Thanks so much for the super sweet feedback :). And please let me know how it goes after ya make it… I’d absolutely love to hear! Absolute pleasure Roslia! And I think that you absolutely most definitely can :)! That color tho… WOW! Absolutely gorgeous and it sounds positively delicious! 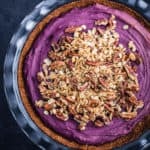 I need to find purple sweet potatoes ASAP as this needs to be made in my house! Ya you do Lori! Thanks so much for the super sweet feedback :). Am definitely a very colorful food kinda gal…. especially purple! Please let me know how it goes after ya make it… would absolutely love to hear! Wishing you find purple sweet potatoes super soon too! wow! 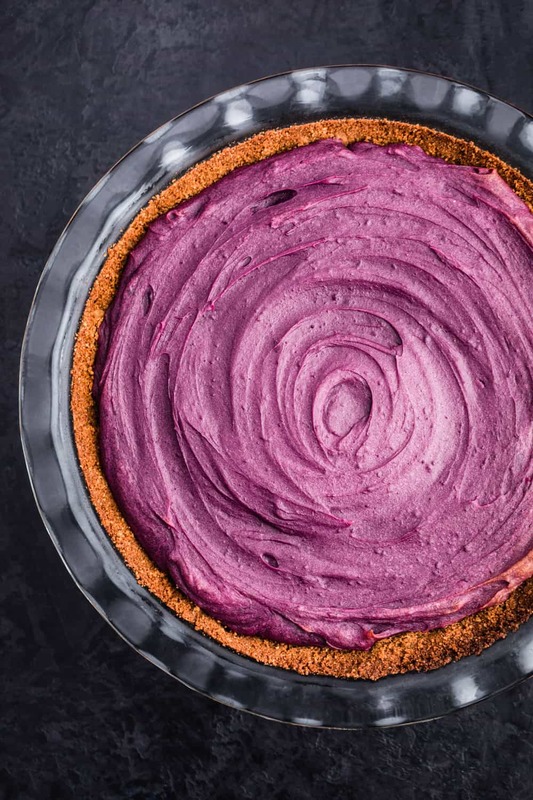 I love that purple color in that pie! It’s just perfect for a spring version of Sweet Potato Pie! Yessss!!!! Thank ya Anne! I def have a *thang* for purple food and am super stoked to hear ya appreciate it too :). 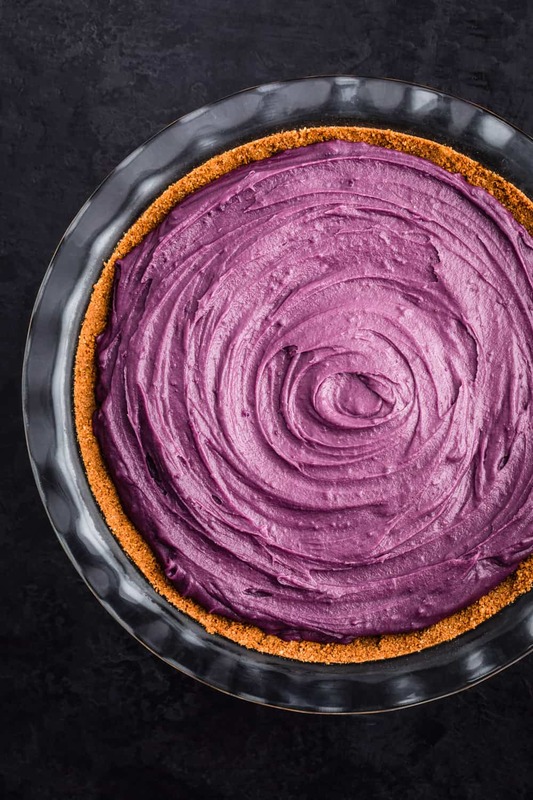 Sweet potato pie is one of my guilty pleasure but i have never seen “Purple sweet potatoes” before. How different are they from regular yams ? Thanks so much for the feedback Analida! All colors of sweet potatoes are quite different from yams (more on this in the post) and there is some slight variation within the different colors of sweet potatoes. Most of what we’re buying labeled yams are actually sweet potatoes too! Do ya have a favorite sweet potato pie recipe? So curious to look at it! Thanks again :). Ooh! What a pretty looking pie! A showstopper for sure! And I never knew you get purple sweet potatoes too. I always thought they were orange or being in colour. Love your pics! Thanks so much for the sweet feedback Saima! And yesssss…. sweet potatoes comes in purple too! So do normal potatoes. If a veggie/root comes in purple I’ll def be sure find it! Wishing you find some purple sweet potatoes super soon too :). That purple color is to die for! Who needs food coloring when you have mother nature? Hehehe exactly!!! But to be fair…. I did put a few drops of ube extract in it… :). But I’m def a very colorful, especially purple food, kinda gal! I am intrigued! I want to try this recipe so bad. It looks delicious and pretty. Thank ya so much Nicole! Stoked to hear you’re intrigued :). Please let me know how it goes after ya make it… I’d absolutely love to hear! I’m so blown away not just with this amazing potato pie, but all your colorful gorgeous photos. Huge fan. Those potato pie are too gorgeous to be eaten but I’m sure it’ll take you to heave, looks delicious! Thanks so much Jo! Really appreciate the feedback! I like to think that it’s *almost* too gorgeous to eat…key word being almost :)!